UK Sails Ireland sailmaker Graham Curran who competed on 'Fools Gold', Ireland's sole entry at the Offshore Sailing World Championships 2018, reviews the event that was truly the pinnacle of cruiser racing in Europe and concludes IRC and ORC need to work closely together, for the benefit of both organisations, so Irish/UK based sailors can compete uninhibited in Europe, and vice versa. The Offshore Sailing World Championship is the premier cruiser/racer keelboat event of the year. It was clear by early 2018 that the competition would be fierce with Class C oversubscribed within a week of entries opening. This resulted in a forty-six boat fleet – no split – forty-six ~35ft cruiser racers on one start line. Class C consisted of a wide variety of yachts – many of which would be familiar to Irish sailors: X-37, J109, X-362 Sport, Beneteau 36.7 (Mod), Farr 30 etc. The class also included several one-off designs built specifically to win this event. The rating system used for the event was an IRC/ORC result combination system. This meant that teams needed to optimise to a good middle ground between the two rating systems. The event in effect was an experiment for the IRC and ORC rating boards to understand the differences in their rules and to help bring them together for closer, more inclusive racing in the future. As racing began, it became clear that some performed better than others. The IRC system used for this event is the one we all know well in Ireland. Sail and yacht designers know what works and what doesn’t for the IRC rule. ORC takes the same measurements IRC does, but also includes many extra measurements such as headboard widths of sails, spinnaker halyard hoist height, inclined waterline lengths and overhangs, rig weight etc. ORC then runs these measurements through their VPP model to determine a yacht's performance across a variety of wind ranges (low/medium/high). With ORC you actually have three separate ratings as opposed to the single IRC rating. On the day of racing, just before the start, the race officer decides which ORC rating he will apply to the fleet depending on the prevailing conditions. This, in theory, provides a fairer rating system for all boats – and encourages designers to produce yachts that are well rounded across all conditions. The event was not going to be won by straight bullets across the board – no one was going to be able to achieve that in a tight forty-nine boat fleet. The most important factor was decided long before racing began – IRC and ORC ratings – specifically how they compared, interacted and combined. Being strong in one system and weak in the other resulted in high final numbers. For example – if Boat A finishes with a 1st in ORC and 7th in IRC the final score is 8 points. Boat B has a 3nd in ORC and a 4th in IRC has a final score of 7 points. The consistency of boat B across both handicap systems means she wins the day. Hubo is a one-off built for this year’s World Championship. UK Sailmakers Ireland has been involved with this project since its inception. From design through to realisation, construction, commissioning, tuning, and iterative performance improvement. Hubo performed well across all conditions and was lightning quick downwind. Her square top mainsail provided ample power in the light choppy conditions off The Hague while her underwater profile allowed her to slip through the strong tide just offshore. Although disappointed with their overall position at the end of the event the team are very pleased with the boat’s performance. Hubo currently leads the Dutch National ORC Championship series. With many lessons learned from this year’s World Championship, she will be back strong to compete for many years to come. Hubo is powered by UK Sailmakers a Uni-Titanium upwind sail package and Matrix spinnakers. “Our journey with UK Sailmakers has been truly special. Not shying away from innovation, we designed a sustainable racer for the World Championship 2018 requiring an equally bold approach from our sailmaker. Our wishes were their command and in the unbelievably short period between launch and the Worlds, when we were tuning for speed, the designers of UK Sailmakers just knew how to translate those findings into seamlessly designed sails with the right cloth. The team calls the A0 a ‘secret weapon’ for a reason. In September 2017, after a successful Irish season, Robert McConnell decided it was time for a new challenge for his A35 “Fools Gold” team. The 2018 calendar would include Wave Regatta in Howth, the IRC Europeans in Cowes in June, culminating in the Offshore Sailing Worlds in The Hague in mid-July. Fools Gold entered the World Championships, as the sole Irish representative, after an encouraging fourth place finish at the IRC Europeans in Cowes. We felt confident, but our ORC performance was still unknown. The A35 has wide full aft hull sections which provide ample righting moment when upwind and exceptional stability downwind. The downside of this shape is increased wetted surface area – drag. To overcome this more sail area is needed, especially upwind. This upwind sail area is effectively taxed under IRC so, in order to remain handicap competitive in prevailing Irish conditions, a compromise must be made. This optimisation produces a “magic number” of approximately eight knots of true wind speed, in which an A35 is at full power and IRC competitive. Under the magic eight knots it will be a struggle for power. ORC, being a very detailed rule, takes the above into account, but also simulates the boat’s performance in different conditions. Theoretical values are deduced from the ORC VPP such as acceleration, upwind VMG, beat apparent wind angles, gybe angles etc. Your rating is then determined using these theoretical values derived from the VPP simulation for a range of conditions. As the inshore racing began, it became evident that the A35 is not kindly rated in the light ORC wind range – based of the simulated values attained. The numbers being seen on the water were in contradiction to the results produced by the ORC VPP. As the inaugural combined IRC ORC World Championships, the event was an experiment to be learned from. After much discussion with the ORC measurers – with the assistance of IRC – there were some inconsistencies found and some small adjustments made, although not enough to rectify the substantial points differential between IRC and ORC results. After three days of medium strength conditions, Fools Gold was in a solid 15th position with aims at top 10 by the end of the week. Unfortunately, the forecast had other ideas with the final two days of racing being light and fickle. Great downwind pace could not outweigh the difficulty of holding upwind lanes in these light conditions. If an A35 were to focus solely on this event then the handicap optimisation would need to be revisited and sail area increased, certainly to the detriment of her IRC competitiveness. The boat would then be uncompetitive in home waters. Although disappointed with the final 22nd place result Rob and crew are delighted with the event and the experience gained. The Offshore Sailing Worlds 2018 was truly the pinnacle of cruiser racing in Europe. The yachts present, the calibre of competitors, and the quality of the racing were like nothing experienced before. Plans are afoot to return and have another shot at the title. J Lance 12, having dominated the IRC Europeans, was the favourite entering the World Championships. She is no standard J112E. J Lance 12 is the factory works boat for the J112E line. She has an ultra-high modulus carbon rig, a lighter hull, and a symmetrical spinnaker setup. She had won the European Championships with ease across a variety of conditions. She was fast, well sailed, and well optimised to both IRC and ORC with rarely more than 4 points differential between her IRC / ORC results. She sailed with only six crew for the World Championships where most were sailing with eight. The Hague is a generally light air venue in July, this was key to her success. Her high upwind mode allowed her to hold tight lanes in the busy fleet and off the start line while her symmetrical spinnaker setup provided her options an asymmetric counterpart would not have. All of the above combined with a well oiled and experienced crew resulted in a deserved World Championship win. The Italia 9.98 is a seasoned ORC World Championship winning design having won the 2015 and 2016 ORCi World Championships – however, they had not raced extensively under IRC. The Italia’s sleek lines give her a shorted waterline when flat in a light breeze – reducing her wetted surface and benefiting her handicap – particularly under IRC. 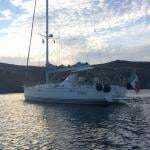 Her well-optimised sail plan, deck configuration, cockpit ergonomics and symmetric spinnaker setup make her an intuitive boat to sail. We found the Italia 9.98 to be particularly fast downwind while being able to hold her own upwind against the majority of the fleet. Provided she sailed the correct lanes in clear air on the first beat she was generally gaining places on the downwind legs – regularly picking up places on the final downwind to the finish. Although not as well optimised as J Lance 12, IMMAC FRAM was able to produce consistent results across both IRC and ORC, particularly in the medium ORC conditions. Occasionally she would have a large 10 point differential between her results when she finished deeper in the fleet. This hurt her chances of overall victory. 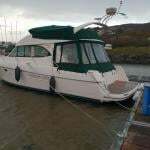 This heavily modified First 36.7 has been with her owner for 14 years and has been heavily modified to remain competitive. She is a multiple national and Europeans ORCi Champion and has been on the podium of the ORCi Worlds several times previously. She is tiller driven with a new keel and rudder by Farr Yacht Design – with another potential keel modification next year. A high modulus carbon rig with curved wing spreaders to increase her fore triangle area. Her cockpit has been extended aft to reduce weight and improve crew ergonomics. She sails with a non-overlapping jib configuration with fine tune system on her in-haulers and halyard so the trimmer from his rail hiking position can alter both. She sailed with a symmetric spinnaker configuration but has bowsprit for a Code Zero/Asymmetric option although she did not run with this for the World Championships. The non-overlapping configuration certainly worked for her, but only in conjunction with the high modulus carbon rig and the curved wing spreaders. This allows enough headsail area to balance the mainsail and keel configuration. Pro4u began the week very strong with two excellent results in the offshore portion of the event. In medium/high ORC ranges, she is extremely quick – especially in the flat water around The Hague. Later in the week when the breeze began to slacken and a slight chop developed, she began to struggle upwind, especially with J Lance 12 breathing down her neck. Pro4u had held the event lead for the entire event until the last race. J Lace 12 match raced her at the start and held her at the back of the fleet in tricky light conditions – there was no way back. J Lace 12 was able to claim overall victory with a better discard. The IRC ORC World Sailing Championships 2018 was a first attempt combination of two similar but unique rating rules. It was successful in its goal of bringing some of the best yachts and sailors in Europe together on one unified racecourse. However, there are many improvements needed before this event can truly succeed. IRC and ORC need to work closely together, for the benefit of both organisations, to bring the rating systems closer together. Each has their own agenda and vision for how to grow our sport but for the benefit of all sailors, their customers, there need to be bridges built. The goal should be compatible, interchangeable ratings so that Irish/UK based sailors can compete uninhibited in Europe, and vice versa.